Summer weather has arrived in Chicago with sweltering temperatures and high humidity (for May, at least). The later parts of this week will mercifully drop back down to the 70's. Here's to hoping my office will be able to figure out a method of cooling the building that doesn't make the power go out ten times a day before the next heat wave. These are the nights when I love to sit on our porch, watching the neighborhood come alive, hoping for a breeze. A cool drink doesn't hurt either. Here is a recipe for one of my favorites. After an inconclusive internet search, I've decided to call this simple concoction Porch Beer. I've seen this drink labeled a Chelada, but in my experience that name most often refers to a beer and clam juice cocktail. I certainly wouldn't want to confuse the two. Please let me know in the comments if you happen to know a more appropriate name. Cut the lime into quarters and run one of the wedges around the rim of a 20 oz pint glass. Pour a tablespoon of salt into a flat dish and coat the glass rim. 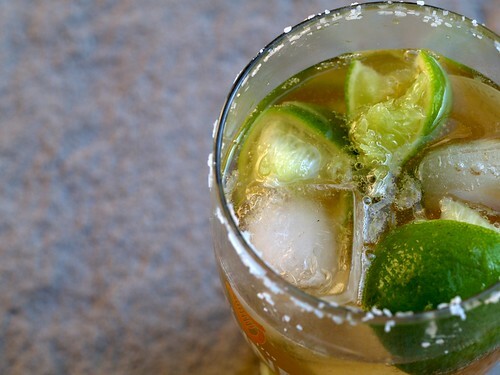 Add four large ice cubes to the glass, squeeze in the lime juice, and add the lime quarters. Top with beer.